This Simple Sesame Roasted Broccoli is easy enough for a weeknight dinner and nutritious enough to fuel you throughout your pregnancy. The delicious recipe is from The Natural Pregnancy Cookbook by Dr. Sonali Ruder—The Foodie Physician. I'm thrilled to be a part of the blog book tour for the latest cookbook from my lovely friend, Dr. Sonali Ruder (aka The Foodie Physician)—and I'm so happy to share her recipe for this Simple Sesame Roasted Broccoli. Sonali's newest book, Natural Pregnancy Cookbook, celebrates delicious foods and places them in the context of nutrition to support a healthy pregnancy. This topic, of course, is right up my alley. In fact, a few of my recipes (my "Pump Up Your Milk" Pumpkin Chocolate Chip Muffins, Cannoli Cream-Filled Strawberries, and Green Grilled Cheese Sandwich) are even featured in the book! So, you'd better believe I'm excited to share this book with you all. Make sure you enter our giveaway below for your chance to win this wonderful cookbook! Sonali is a board-certified Emergency Medicine physician, mom, culinary school grad, recipe developer and, now, the author of multiple cookbooks. She uses her medical and culinary backgrounds to create healthy and delicious family-friendly recipes. She's also a wonderfully generous food blogger buddy of mine; she has been a true inspiration and support to me. We've even been lucky enough to have her guest post for the Full Belly Sisters blog—check out her gorgeous Moroccan Spiced Salmon. 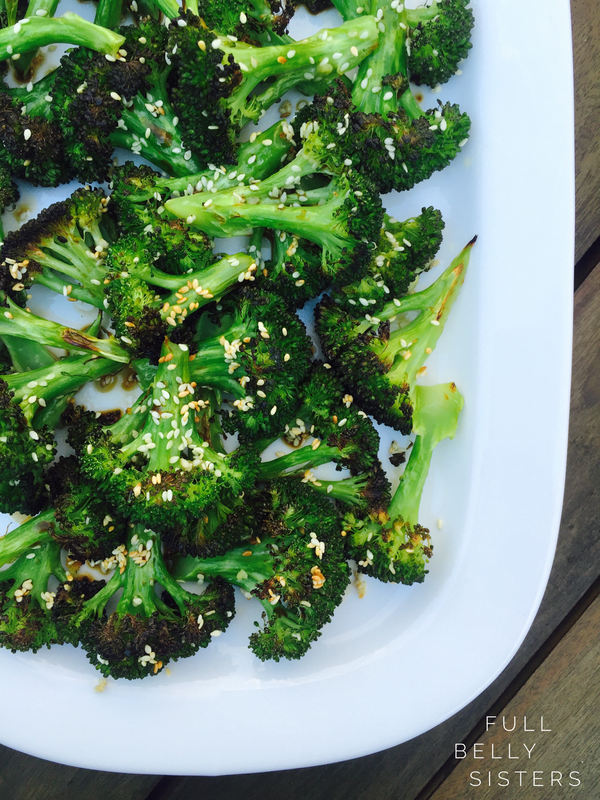 Today, I'm sharing with you a delicious recipe for a Simple Sesame Roasted Broccoli (page 223 in the book). Broccoli is wonderful for everyone, of course; for you pregnant gals, it's especially fantastic. Packed with folate, fiber, and Vitamin C, it's a great addition to your diet. And this recipe—with its Asian flavors—is both tastier and infinitely healthier than your average Chinese take-out. Preheat oven to 450 degrees. Mix the oil and garlic in a large bowl; add the broccoli spears and toss to coat evenly. Transfer the broccoli to a baking sheet (I covered mine in foil for easier clean-up) and spread the broccoli out so it's in a single layer. Roast in the oven for about 12 minutes, turning halfway through. Then sprinkle the sesame seeds over the broccoli and roast for about five more minutes. The broccoli should be tender-crisp and the sesame seeds lightly toasted. Remove the baking sheet from the oven. Place the broccoli in a large bowl and then drizzle the soy sauce and vinegar on top. Toss to combine. Season with salt and pepper to taste. So easy! And this is just the kind of dish I recommend to clients: low in calories, but absolutely packed with nutrients. Oh, yeah, and super yummy. It's the perfect nosh for pregnancy cravings—kinda crunchy, a little salty, and very nutritious. I'm so grateful to Sonali for sharing this wonderful cookbook with me. And I'm especially excited to share my copy with you! 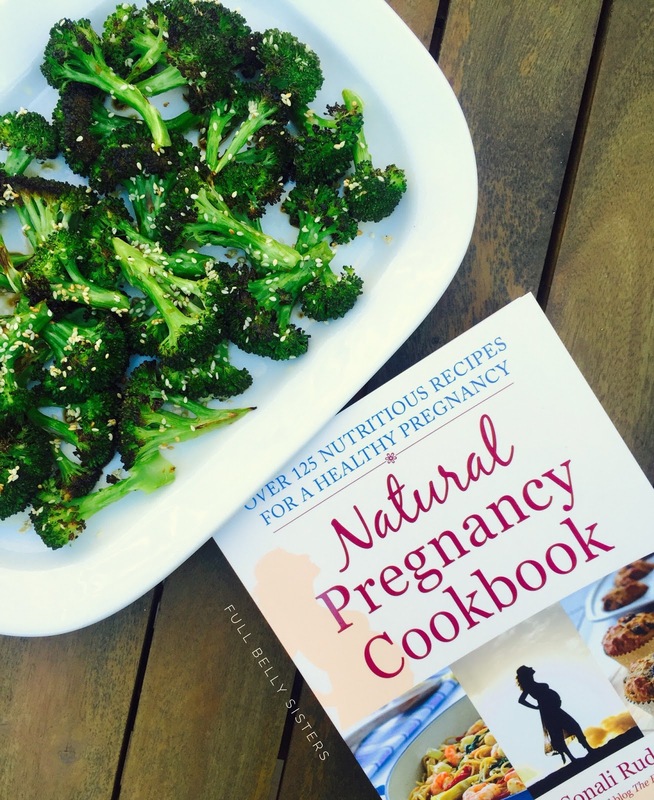 One lucky winner will get a copy of Natural Pregnancy Cookbook—just enter via the Rafflecopter below. Good luck! UPDATE: Check out Healthy Aperture's review of Natural Pregnancy Cookbook, which features my "Pump Up Your Milk" Pumpkin Chocolate Chip Muffins! We make a similar broccoli and the kids always devour it! Your pictures and leaving me wanting it for lunch! Yum! Thanks so much for the wonderful book review, Justine! I'm so happy that you liked the book and think that it would be a useful resource for expectant moms. I was honored to use your recipes in the book and was excited to see that Healthy Aperture had featured your muffins on their blog! Yum. This looks really tasty! With my oldest I craved Boston Market Mac N Cheese (specifically! ), with my middle child I craved Chinese food and Twix and with my youngest I craved Twix and that was really it. I craved French Fries when I was PG and now my son can't get enough! I love simply roasted broccoli, I just finished eating some for lunch. I love the flavors. This broccoli looks so good. It's one of my favorite veggies (and I love most veggies). And I'm always on the lookout for new ways to prepare it. Thanks! I love simple broccoli recipes like these - so tasty. We adore roasting all kinds of veggies and know we will really enjoy your roasted broccoli. Quick, colorful, healthy and YUM! Broccoli is a favorite around here! I will try this recipe! This broccoli looks so delicious! I often roast broccoli, as my daughter loves it so much. Will try your version too. I love broccoli and need to eat more of it. I love roasted broccoli but never thought of adding sesame seeds! What a delicious idea! Need to try this soon!!! Easy and simple and healthy and delicious, win, win, win!! I absolutely love broccoli so this looks right up my street. Must try this! I love broccoli and this one looks amazing! A lovely and simple sounding broccoli side dish - I bet my family would love this! I bet the recipes are all delicious!